*Started February 2002 in Provo, UT, finished November 2009 in Kansas. 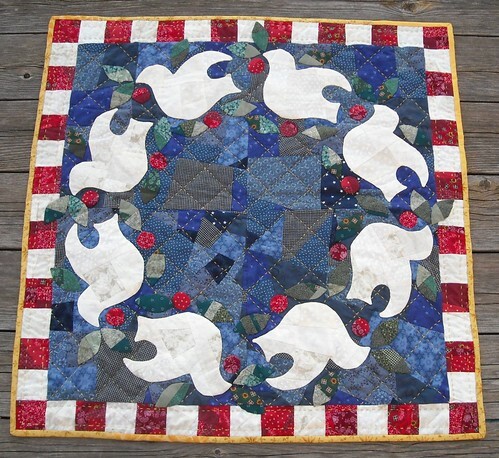 *Pattern is from American Patchwork and Quilting, I will look up the issue number later. *Dove appliques were made by sewing the shapes right side to interfacing, then cutting a slit in the interfacing to turn them right side out. This way I didn't need to worry about keeping the edges in line as I appliqued them to the background. *Berries and leaves were done in a needle-turn sort of method. *Hand quilted with DMC perle cotton. I prefer quilting with 2 strands of embroidery floss; you can pop the knots to the inside. *I didn't buy enough binding fabric the other day and I was NOT going back so I found a couple of similarly colored fabrics and did another monochromatic-yet-scrappy binding. *I wish the leaves were made of lighter greens to contrast better with the blue backing. *some sort of Advent calendar, maybe made with wool felt stockings and mittens. *long sleeve t-shirts for me, kind of fancied up. I love it!!! That's my favorite way of doing applique, too. LOVE it! I'm impressed that you kept it around for seven years! That's awesome! Hi Vicki, thank you so much for the comment. Your quilt is just gorgeous! I'm very jealous of your quilting talent (I couldn't if I tried). Really enjoying your blog, I'm hooked. Beautiful, and what a great feeling to have something you started a long time ago finished!!! Ilove the contrast of the binding very nice!!! It's so beautiful! I love the pattern and thanks for sharing your super smart idea for the bird appliques! I have this pattern but have always been afraid to try it. I love how yours turned out. You did a great job and you have "sew inspired" me to get started on mine. Thanks for sharing. Congratulations on completing an old project. It's very nicely done. 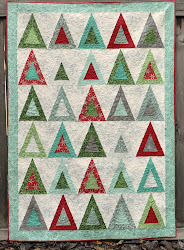 block party quiltalong and giveaway! daily blogging, every day in November!